The very first 8” vinyl version of Nathan Cleary’s epic Spongrenade has been released and it’s this epic Sponge Bomber edition! This mash-up of a grenade with SpongeBob SquarePants shows what lays just underneath that happy, smiling exterior. 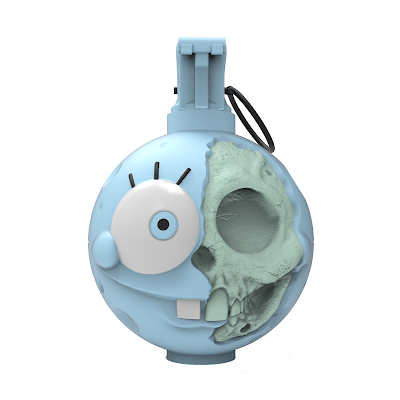 Produced by Pobber Toys, the Sponge Bomber Spongrenade vinyl figure is being released for the very first time in a light blue Ice Cream Edition. This colorway is limited to 150 pieces, stands 8” tall and includes a Certificate of Authenticity. Collectors of Cleary’s Weapons of Mass Confusion series can pre-order this figure now at Nathan’s online store for £125.